While there was a time before the internet for me, it came in it to widespread use towards the end of my time at school so I've spent way more of my life with it than without it. But look at those numbers, there is a 12,000 mile cable somewhere in the world that needed to be laid in order for this to work between nations and continents. I barely drive half that distance every year! In 2008, damage to two marine cables near the Egyptian port of Alexandria affected tens of millions of internet users in Africa, India, Pakistan and the Middle East. Given the cables are described as being as thick as a garden hose, I'm surprised there haven't been more significant outages over the years. I doubt I'm alone in considering access to online services an amenity and necessity rather than a privilege. But all that convenience, entertainment and information doesn't come for free. Being responsible for 20% of energy use is a staggering number to me too, considering how many non-LED bulbs must still be in use across the world. It's saving grace is that it would 'only' account for 5% of carbon emissions, something that it's been great to see tech companies like Apple and Tesla leading to change the mindset of where energy should come from. We're talking pennies but given the size of the infrastructure required, I'm not sure if the cost is surprising or not? 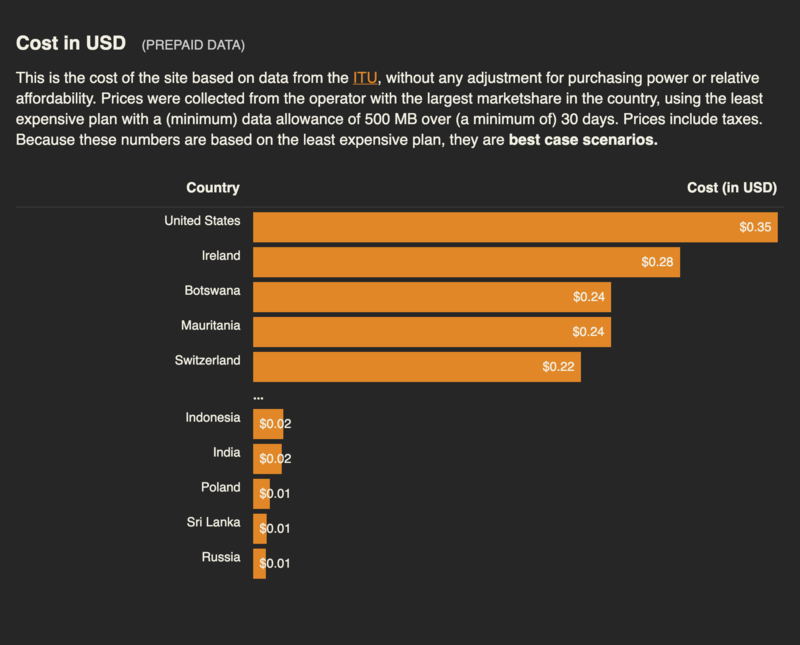 The United States and Ireland being 35x what it costs in Sri Lanka and Indonesia was surprising to me, at least. As part of my ongoing and incremental improvements to 1 Thing A Week, I'll see if I can bring that cost down for my American visitors!